The driving forces of cloud technology, big data analytics and the Internet of Things (IoT) have sparked a new wave of innovations for the retail industry. 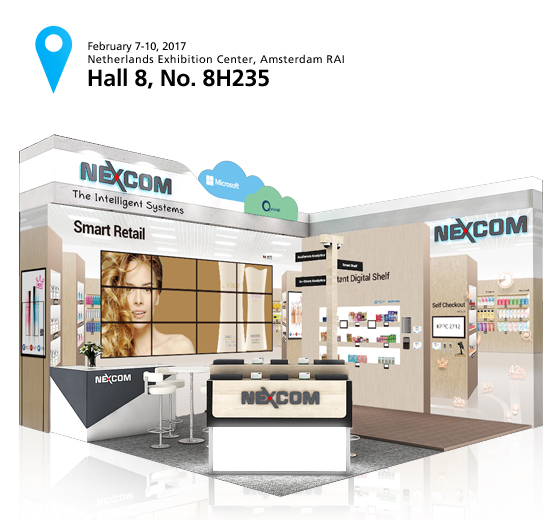 To showcase a smarter retail, NEXCOM will present its full lineup of interactive signage at the 2017 Integrated Systems Europe (ISE) exhibition, taking place at Amsterdam RAI, Netherlands from February 7 to February 10. At 2017 ISE, NEXCOM will show how interactive signage with various bundled technologies can help retailers build a smart shop, and drive retailing into new landscape. To boost viewers’ attention and engagement, NEXCOM will demonstrate a 4x3 video wall which can interact with viewers while presenting dynamic targeted contents with stunning visuals to create an engaging experience. NEXCOM high performance video wall player, NDiS B8C6, equipped with 12 independent HDMI outputs, is specifically designed to address the need for video wall applications that require high quality video contents across 12 displays. Further integrating with cameras, facial recognition technology and Quividi cloud service platform, the NDiS B8C6 can analyze audience demographics such as age, gender and other attributes to display content tailored to the interest of a target audience group. Furthermore, NEXCOM will also showcase a smart shelf and self-checkout service by utilizing the digital signage player NDiS B535 and kiosk panel PC KPPC 2721 to present dynamic promotion price with personalized ads and cut customer queuing time. The NDiS B535 integrated with Intel® Retail Sensor technology can detect any commodities picked up from the shelf while the electronic shelf labels will show dynamic pricing and deliver relevant ads to the viewers. Based on Intel® Celeron® processor J1900 and rich I/O interfaces, NEXCOM KPPC 2712 not only can connect self-checkout devices like external printer, RFID and POS reader for making payments, but also deliver dynamic information boosting viewers’ attention and engagement. Last but not least, NEXCOM will utilize a business intelligent system to collect visitor traffic flow and dwell time to identify hot zones and the most gazed at products. NEXCOM digital signage player NDiS B325 based on Intel® Core™ i5-6200U processor can act as a microserver to help savvy retailers comprehensively collect and accurately analyze buying patterns and measure customer engagement, offering retailers valuable information to optimize shelf assortment, craft marketing strategies, and ultimately increase in-store sales.